This week I was included in an e-mail discussion between MaryLynn Pulscher and Annie Olson at the park board and Daniel Fearn. Daniel had found two interesting metal markers in the ground near Minnehaha Creek. Daniel wondered if CMPC was an acronym for City of Minneapolis Park Commission. My reaction, as well as MaryLynn’s, was that wasn’t likely because the park board until 1969 always marked everything BPC for “Board of Park Commissioners.” The Minneapolis was generally understood. 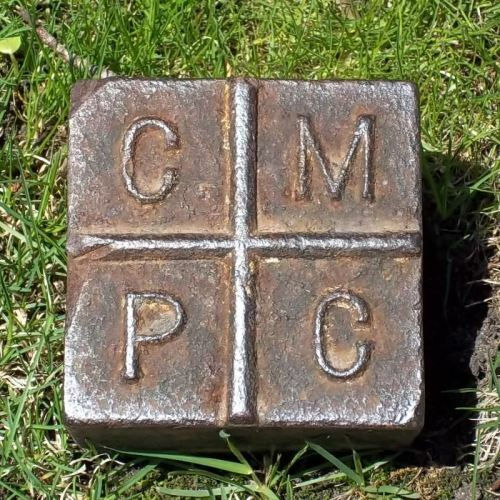 Do you know the real story of the CMPC markers? Have you seen other markers like this anywhere else in the city? Were they on park boundaries? Or do I have to call the county surveyor’s office to resolve this? Send photos if you have ’em. David, did you ever learn anything more about this marker. I walk by it regularly and always wonder. I have not looked further into the issue of the markers, Lynn. I’ve not heard from any other readers either. Some surveyor must know the meaning of the markers. One of these days! David – I’m not sure if this is the same marker that I walk by on my neighborhood and creek walking tour. The address is 72 W. Minnehaha Parkway, in the lawn on the private property side of the sidewalk. I’ve always wondered what it was and what the initials stood for. That’s the one in the photo, Tom.